Report: In A Decade (Or Sooner), Pakistan Could Be No. 3 Nuclear Power : The Two-Way Two think tanks estimate that Islamabad could have 350 warheads in the next several years as it outpaces rival India and several other nations in production. During a test last November, the intermediate range ballistic missile Shaheen 1A (Hatf IV) is launched from an undisclosed location in Pakistan in a photo supplied by the Pakistani military. The missile is said to be capable of carrying nuclear warheads. Pakistan could have 350 nuclear warheads sometime in the next decade, becoming the world's No. 3 nuclear power by outpacing rival India and several other nations in bomb-making, according to a new report issued by two think tanks. The report, A Normal Nuclear Pakistan, written by the Carnegie Endowment for International Peace and the Stimson Center, says: "in the next five to 10 years Pakistan could have a nuclear arsenal not only twice the size of India's but also larger than those of the United Kingdom, China, and France, giving it the third-largest arsenal behind the United States and Russia." 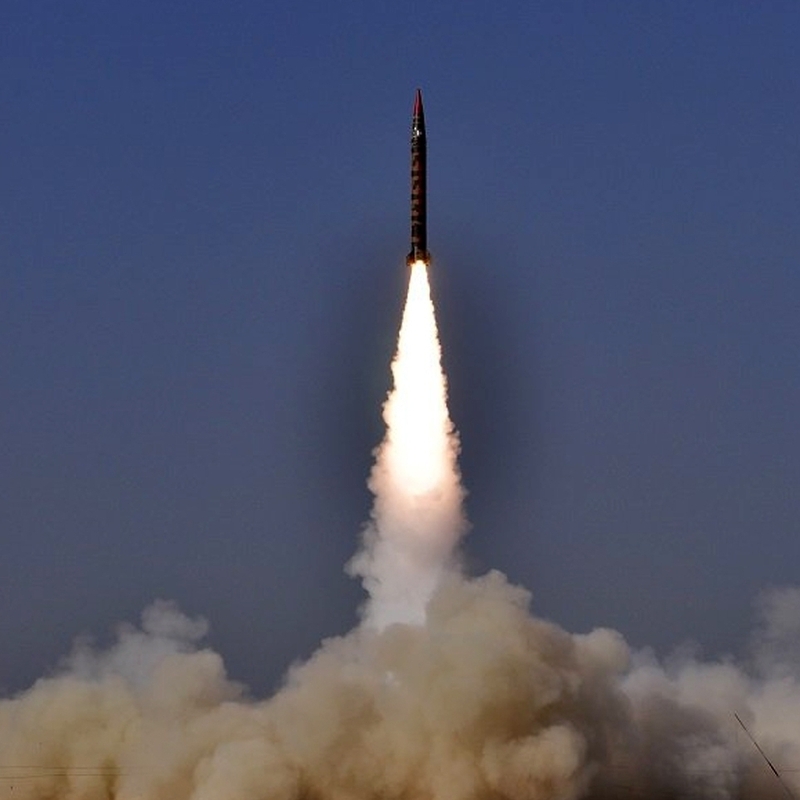 In 2013, estimates of the size of Pakistan's current nuclear arsenal ranged from about 90 to 120 warheads. The report says that Islamabad could step up production to about 20 nuclear warheads a year. "Many observers have concluded that Pakistan's rate of fissile material production (and assumed construction of nuclear weapons) gives it the fastest-growing nuclear weapons stockpile," the report says. "The growth path of Pakistan's nuclear arsenal, enabled by existing infrastructure, goes well beyond the assurances of credible minimal deterrence provided by Pakistani officials and analysts after testing nuclear devices," the it adds. According to the Federation of American Scientists, Cold War rivals Russia and the United States possess by far the lion's share of the world's nuclear arsenal, with an estimated 7,500 and 7,200 warheads, respectively. France, China and the United Kingdom each possess between 200 and 300 warheads, while India is currently thought to have about 100. As The Washington Post notes: "Western officials and analysts have struggled for years to get an accurate assessment of Pakistan's nuclear capabilities. Several Pakistani analysts questioned the findings of the report, saying it is based on a faulty assumption that Pakistan is using all of its existing stockpiles of fissile material to make nuclear weapons." One critic, nuclear expert Mansoor Ahmed of Quaid-e-Azam University in Islamabad, is quoted by The Express Tribune as saying that he believes that Pakistan can't make more than 40 or 50 new warheads over the next several years. "This report is overblown," Ahmed is quoted by the Pakistan-based English-language daily as saying. However, he acknowledged: "What the world must understand is that nuclear weapons are part of Pakistan's belief system. It's a culture that has been built up over the years because [nuclear weapons] have provided a credible deterrence against external aggression."